While we’re already well into our planning for 2019, we want to take a minute to reflect on 2018. For a whole bunch of reasons, this past year ended up being one of the most fun ones in recent memory. We splashed through some puddles, we drank wine, we partied with the Ducks, we pedaled through Hell, we Let ‘er Buck, and we got our first taste of Gravel. While next year will be more of the same, and hopefully even better, it will also be a bit different without our grand planner of routes, noted safety enthusiast, and purveyor of corny jokes, Ken Chichester riding shotgun. Ken officially retired from Cycle Oregon after the Classic this year and we miss him already. 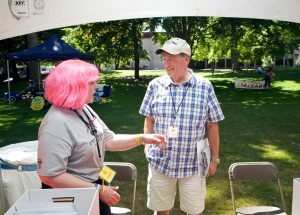 It’s hard to overstate just how much of an impact Ken has had on Cycle Oregon, but it’s safe to say that it wouldn’t be anywhere near the event it is today without his two-plus decades of devoted service. For those keeping score at home, this will be Ken’s fourth retirement and he’s hoping this time, maybe it will stick. Ken’s first Cycle Oregon as a rider was in 1992 and, as he puts it, he “had some ideas about how things could go smoother”. As a police officer at the time, Ken volunteered to be a liaison between law, transportation, cities and counties and Cycle Oregon. 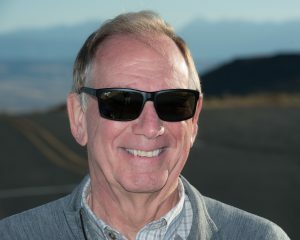 In 1995, Ken retired from the State Police and was appointed to Cycle Oregon’s board. He served there for 13 years before retiring again. Then, only weeks into this retirement, Ken was asked to come in to handle permits. He was soon reunited with his not-yet-cold seat on the board (“We voted, you’re in!”) and placed in charge of route planning, and route management. Ken has ridden Cycle Oregon for 20 years in one capacity or another and, including scouting pre-rides, he estimates he has ridden about 40 complete routes over the years. That’s a whole lot of miles! Ken’s generous and tireless work ethic, his seemingly never-ending supply of stories, and his Rainman-like knowledge of every highway, biway, back road and goat trail in Oregon make him one of kind. We’ve been extremely lucky to have worked with him for so many great years and we consider him to be part of the family. Ken’s only advice for Tom Simonson, who has taken over route planning and safety talks during our pre-ride briefings is, “Whatever you do, don’t tell a joke from the stage. Once you start, they will never let you stop”. My husband Matt and I have appreciated Ken Chichester very much all these years. 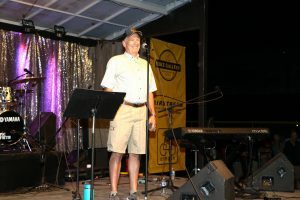 We have ridden in Cycle Oregon events since 1990, mixed with volunteering, and seeing Ken and laughing at his on-stage antics has been a highlight of every ride. We loved his route choices, even when they were hard. We have always taken his safety advice very seriously too. We’ll miss you, Ken, but we have many happy memories! Yes, Ken will be missed. My first ride was 1993 & last one 2012, so have enjoyed his stage humor & route expertise for many years. Best wishes, Ken, for a happy, healthy retirement. You will be missed Ken. You were the reason I was able to successfully complete Cycle Oregon and I am so grateful for all of your support!! Enjoy retirement, you have certainly earned it Ken!! Since I started riding CO in 1991, I’ve been around for most of Ken’s appearances. He will be missed. Ken, like Jonathon, was a voice which riders looked forward to each evening. His guidance (as well as the jokes) was always welcome. Of course the course layout was much appreciated, too. That job must have been very challenging.